As a subset of glycosyltransferases, the family of sialyltransferases catalyze transfer of sialic acid (Sia) residues to terminal non-reducing positions on oligosaccharide chains of glycoproteins and glycolipids, utilizing CMP-Neu5Ac as the activated sugar nucleotide donor. In the four known sialyltransferase families (ST3Gal, ST6Gal, ST6GalNAc and ST8Sia), the ST8Sia family catalyzes synthesis of α2, 8-linked sialic/polysialic acid (polySia) chains according to their acceptor specificity. We have determined the 3D structural models of the ST8Sia family members, designated ST8Sia I (1), II(2), IV(4), V(5), and VI(6) using the Phyre2 server. Accuracy of these predicted models are based on the ST8Sia III crystal structure as the calculated template. The common structural features of these models are: (1) Their parallel templates and disulfide bonds are buried within the enzymes and are predominately surrounded by helices; (2) The anti-parallel β-sheets are located at the N-terminal region of the enzymes; (3) The mono-sialytransferases (mono-STs), ST8Sia I and ST8Sia VI, contain only a single pair of disulfide bonds, and there are no anti-parallel β-sheets in ST8Sia VI; (4) The Nterminal region of all of the mono-STs are located some distant away from their core structure; (5) These conformational features show that the 3D structures of the mono-STs are less compact than the two polySTs, ST8Sia II and ST8Sia IV, and the oligo-ST, ST8Sia III. 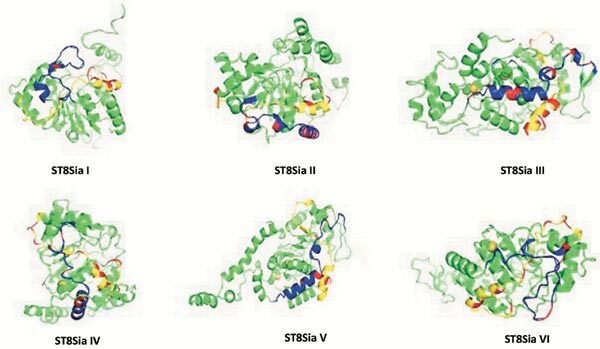 These structural features relate to the catalytic specificity of the monoSTs; (6) In contrast, the more compact structural features of ST8Sia II, ST8Sia IV and ST8Sia III relate to their ability to catalyze the processive synthesis of oligo- (ST8Sia III) and polySia chains (ST8Sia II & ST8Sia IV); (7) Although ST8Sia II, III and IV have similar conformations in their corresponding polysialyltransferase domain (PSTD) and polybasic region (PBR) motifs, the structure of ST8Sia III is less compact than ST8Sia II and ST8Sia IV, and the amino acid components of the several three-residue-loops in the two motifs of ST8Sia III are different from that in ST8Sia II and ST8Sia IV. This is likely the structural basis for why ST8Sia III is an oligoST and not able to polysialylate and; (8) In contrast, essentially all amino acids within the threeresidue- loops in the PSTD of ST8Sia II and ST8Sia IV are highly conserved, and many amino acids in the loops and the helices of these two motifs are critical for NCAM polysialylation, as determined by mutational analysis and confirmed by our recent NMR results. In summary, these new findings provide further insights into the molecular mechanisms underlying polyST-NCAM recognition, polySTpolySia/ oligoSia interactions, and polysialylation of NCAM. Keywords: Polysialic acid, Polysialylation, α2, 8-sialyltransferases (ST8Sia), Polysialyltransferase Domain (PSTD), Polybasic region (PBR), Neural Cell Adhesion Molecules (NCAMs), Protein 3D structure, Phyrene2 Server, Cancer metastasis, NMR spectroscopy, Sialic Acid Storage Diseases, Neurobiology & Neural System Diseases. Keywords:Polysialic acid, Polysialylation, α2, 8-sialyltransferases (ST8Sia), Polysialyltransferase Domain (PSTD), Polybasic region (PBR), Neural Cell Adhesion Molecules (NCAMs), Protein 3D structure, Phyrene2 Server, Cancer metastasis, NMR spectroscopy, Sialic Acid Storage Diseases, Neurobiology & Neural System Diseases. Abstract:As a subset of glycosyltransferases, the family of sialyltransferases catalyze transfer of sialic acid (Sia) residues to terminal non-reducing positions on oligosaccharide chains of glycoproteins and glycolipids, utilizing CMP-Neu5Ac as the activated sugar nucleotide donor. In the four known sialyltransferase families (ST3Gal, ST6Gal, ST6GalNAc and ST8Sia), the ST8Sia family catalyzes synthesis of α2, 8-linked sialic/polysialic acid (polySia) chains according to their acceptor specificity. We have determined the 3D structural models of the ST8Sia family members, designated ST8Sia I (1), II(2), IV(4), V(5), and VI(6) using the Phyre2 server. Accuracy of these predicted models are based on the ST8Sia III crystal structure as the calculated template. The common structural features of these models are: (1) Their parallel templates and disulfide bonds are buried within the enzymes and are predominately surrounded by helices; (2) The anti-parallel β-sheets are located at the N-terminal region of the enzymes; (3) The mono-sialytransferases (mono-STs), ST8Sia I and ST8Sia VI, contain only a single pair of disulfide bonds, and there are no anti-parallel β-sheets in ST8Sia VI; (4) The Nterminal region of all of the mono-STs are located some distant away from their core structure; (5) These conformational features show that the 3D structures of the mono-STs are less compact than the two polySTs, ST8Sia II and ST8Sia IV, and the oligo-ST, ST8Sia III. These structural features relate to the catalytic specificity of the monoSTs; (6) In contrast, the more compact structural features of ST8Sia II, ST8Sia IV and ST8Sia III relate to their ability to catalyze the processive synthesis of oligo- (ST8Sia III) and polySia chains (ST8Sia II & ST8Sia IV); (7) Although ST8Sia II, III and IV have similar conformations in their corresponding polysialyltransferase domain (PSTD) and polybasic region (PBR) motifs, the structure of ST8Sia III is less compact than ST8Sia II and ST8Sia IV, and the amino acid components of the several three-residue-loops in the two motifs of ST8Sia III are different from that in ST8Sia II and ST8Sia IV. This is likely the structural basis for why ST8Sia III is an oligoST and not able to polysialylate and; (8) In contrast, essentially all amino acids within the threeresidue- loops in the PSTD of ST8Sia II and ST8Sia IV are highly conserved, and many amino acids in the loops and the helices of these two motifs are critical for NCAM polysialylation, as determined by mutational analysis and confirmed by our recent NMR results. In summary, these new findings provide further insights into the molecular mechanisms underlying polyST-NCAM recognition, polySTpolySia/ oligoSia interactions, and polysialylation of NCAM.